Emax - Actuna Sp. z o.o. EMAX ESC 20A regulator with SimonK ESC software - high quality electronic speed controller at a fantastic price! Designed for easy installation and easy configuration. The world's smallest volume regulator Mini EMAX Nano 12A OPTO suitable for racing multi-cameras such as QAV180 210 250 150. BLHeli software provides OneShot125 support. 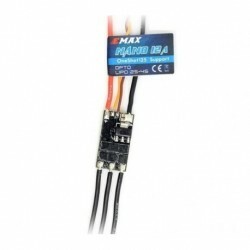 EMAX ESC 20A regulator with BlHeli software ESC - high quality electronic speed controller at a fantastic price! Designed for easy installation and easy configuration.